Prominent & Leading Manufacturer from Delhi, we offer cartoon dustbins, frp dustbins and double stand frp dustbins. Design Rabbit Penguin Fish Micky Mouse and Many More designs are available. Under the strict supervision of our experienced professionals, we are offering an innovative collection of Cartoon Dustbins. 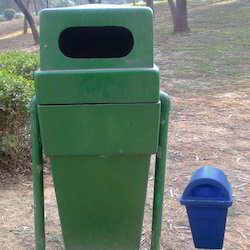 Our provided dustbins are availed in varied designs and sizes for our customers to choose from. Widely used in parks and residential apartment, these dustbins are precisely manufactured by using premium quality raw material and advanced technology by our skilled professionals in line with industry standards. Besides, provided dustbins can be availed from us at pocket friendly prices. We MPH Group are effectively engaged in manufacturing, exporting and supplying quality FRP Dustbins for our esteemed customers in Delhi, India. Used in house Cleaning purpose. The FRP Dustbins offered by us have a distinguished image in the industry, and easily accessible at very reasonable market cost.